Jeff recently got me the revised Tom Rath book, Strengths Finder 2.0. Somewhere around 4 years ago I completed my first Strengths test and have since gone on to enjoy many works of optimal thinkers. According to Rath version 2.0 includes 5,000 new combinations within the tests responses and that while some may change the likelihood is what does shift was in your top 10 all along. I also believe that we are in constant growth and as we experience new things and different ways of processing we will grow and shift these islands of meta-self around fairly regularly. In my case I still align with my primary value of Strategic. Others are drifting place or alignment but and I can see myself within the details. Of course some will say anyone can relate to their fortune. Maybe true. Take it all as a grain of sand and build upon it what you will. I am goal oriented and having ideas of where I currently am helps me hone those further and possibly bring others to bear through natural synergies. I recommend looking in to Strengths Finder and the Authentic Happiness questionnaires at the University of Pennsylvania. If information is vital in the world isn’t it worth your time to understand your self a bit more? 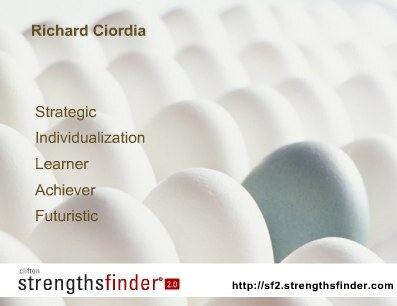 Strengths Finder 2.0 gives a real nice summation to how each strength is put in play. Here’s my primary strength, Strategic. By nature, you usually feel satisfied with life when your innovative thinking style is appreciated. You automatically pinpoint trends, notice problems, or identify opportunities many people overlook. Armed with this knowledge, you usually devise alternative courses of action. By evaluating the circumstances, available resources, and/or the potential consequences of each plan, you can select the best option. Because of your strengths, you periodically identify problems others fail to notice. You might create solutions and find the right answers. Perhaps you yearn to improve certain things about yourself, other people, or situations. Maybe you are drawn to specific kinds of classes, books, or activities. Why? Maybe they promise to give you the skills or knowledge you seek. Instinctively, you feel wonderful when people value your innovative and original ideas. You are likely to help them envision what can be accomplished in the coming months, years, or decades. Chances are good that you may pay attention to some of the things going on around you. Perhaps you listen, quiz people, read, or take notes. As you accumulate information, you might disregard what is unrelated, and pay heed to what seems important. Sometimes the more you reflect on what you know, certain problems reveal themselves, and eventually some solutions start taking shape in your mind. Then you try to select the best plan from your list of options. Driven by your talents, you probably feel very good about yourself and life in general when you know the exact words to express an idea or a feeling. Language has fascinated you since childhood. Your ever-expanding vocabulary often earns you compliments. A grain of sand and a few seashells adorning the new wing of my mental sand castle. It will continue to evolve and shape, even at times may need rebuilding. This updated information provides me with some new perspectives and thoughts to digest. If you find some of your own along the way feel free to add them here so I might know you even better.